Visionary and practical, Nancy Alexander has more than 25 years of experience helping leaders and organizations make a transformational impact. Her clients are leaders of businesses and professional firms, start-ups, foundations, educational institutions, non-profit organizations, associations, and communities who attain sustainable results through sound and focused envisioning, goal-setting, and action. 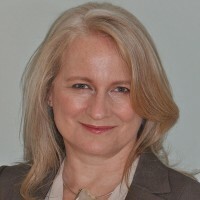 Nancy is a Columbia University-certified executive coach, member of the Bregman Leadership Coaching team, a trained mediator, certified systemic team coach and one of fewer than 40 Certified Master Facilitators (the highest credential in the facilitation field) worldwide. In 2017 she will complete the Diploma in Systemic Team Coaching from the Academy of Executive Coaching, UK. Nancy began her career in brand management, marketing, strategic planning, and new ventures with Procter and Gamble and American Express. After serving as a Bank of America vice president, she became a social innovator and eco-entrepreneur and founded one of the first green consumer product and service companies in Connecticut. Born into a theatre and film family and a graduate of New York City public schools, Nancy earned her BA in sociology and MBA from Yale and an MA in women’s studies at Southern Connecticut State University, and was a PhD candidate in religious studies at Lancaster University, UK. She is also a Yale Public Voices Fellow with the Op-Ed Project, and a member of the Golden Seeds angel investor group. Completing the New York City Marathon took her almost as long as raising four daughters.